Here are Klinkenberg and Stephenson's golden rules of dressing for success on the fairways -- follow them and you may not score under par, but you will surely look good trying. 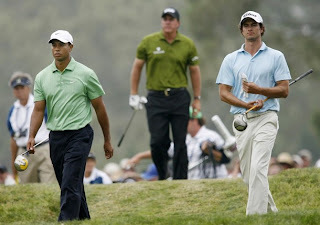 Here a shot of Tiger, Phil and Adam Scott all sporting conservative golf attire. Always wear a collared shirt. A T-shirt is never acceptable. Avoid flashy colors or patterns. You don't want to clash with the scenery. Jeans and short shorts are never acceptable, though knee-length shorts can be worn in hot weather. Clothing should fit well and not hinder your game. Pants and shirts should be clean and pressed. Golf shoes should look like dress shoes, not sneakers. And they don't have flaps! Socks should usually be the color of the shoe, and ankle length with shorts. Shorts and knee-length shorts are acceptable in warm weather, but pants are preferred. Check with the club about capri pants. Avoid gaudy or tacky clothes that could distract from the game. You don't want people screaming "FORE!" when they see your blouse. People don't want to hear jingle bells while walking or playing, so leave the charm bracelets and noisy jewelry at home. Spandex tube tops and spaghetti straps are a no-go.